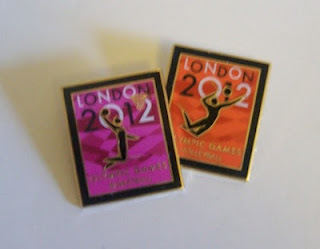 Well, my day for the Olympic Games arrived yesterday, the first official day of competition. Not only did I have tickets for the women’s basketball, but my wife also surprised me with tickets to see the women’s handball in the morning (also purchased through a reseller). With all the warnings of huge crowds, transportation delays, and lengthy security checks, we decided we would have to set out extra early in order to make our 9:30 handball start. We woke up at 5 AM and were out of the door by 5:20. We reached Oxford train station in plenty of time to catch the 6:30 train to London. I admit, I was slightly worried that we hadn’t booked ahead, but this fear proved groundless. The train wasn’t full, although it had plenty of people, including several groups obviously headed to the games. There were some guys dressed in cycling jerseys, apparently heading into London to see the Road Race. A small contingent got off the train in Slough, where the rowing events are being held. We got into Paddington Station just a little past 7:30. There are several ways to reach the Olympic park once you are in London. We decided to take the tube to Liverpool station and then a train down to Stratford. There were lots of Olympic volunteers on hand at Paddington (and all the major stations) to give advice and assistance to anyone who might be lost. The tube was un-crowded and so was the train. In fact, everything ran so smoothly that we arrived at the Olympic park just after 8:00, well ahead of our 8:30 prediction. Walking up to the park was a pretty magical experience. Beyond the gateway, we could see the Olympic Stadium and the strangely alluring Orbit. The Orbit is a strange structure, a tower of swirling metalwork, designed in such a way that it appears to have grown organically from the ground, carrying aloft a huge concrete bunker. While the £14 entry price seemed rather extortionate to me, I was glad to see it from the outside, and believe it really added to the effect of the entire park. Arriving so early, we breezed through security. All of the volunteers and the numerous military personnel were all cheerful, friendly, and efficient. It would be interesting to see if they can continue those levels through three weeks of crowds. With nearly an hour before our first event, and finding ourselves near the BIG Olympic store, we thought it would be good to pop into that first and not have to face the crowds later. The store featured all the stuff you would expect to find, most of it junk, but many items featured the very attractive logos that have been designed for each sport. My wife bought a black t-shirt with the purple and gold basketball logo, and a Team GB, Olympic basketball which is sure to thrill her school basketball club. I purchased a pair of pins with the little sports logos. I meant to buy the pins for the sports we were going to see, but somehow managed to make it home with Basketball and Volleyball. Oh well, they are still really nice. Another cheerful volunteer checked us out, and checked her watch to make sure we still had time to reach our first event. From the store, it was just a short walk to the Copper Box, the building built to house Team Handball. For those who are wondering, the sides of the rectangular building are covered in coppery metal plates, an odd, but not unpleasing design. With a bit of time yet remaining, we decided to stop and get food. Food actually proved the big let-down of the day. Despite having more than enough volunteers to man the stand, the poor people seem to have little idea what they were doing. They struggled to serve anyone. When we finally reached the front of the line, with time counting down, we ordered a couple of sandwiches and drinks. I’m pretty sure the calzone-like sandwiches we were given were supposed to be heated, but no matter. I was in too good a mood to care. Later in the day, we twice encountered stands that didn’t have the food they had advertised, and more workers who didn’t seem to know quite what to do. Still, it was the first day. I’m sure most of these bumps will be sorted out. The food was universally mediocre and overpriced, but no more so than one expects at a major sporting event. The selection was also disappointing, which I believe is down to the ‘Corporate Sponsorship’. You couldn’t get a decent ice cream in the place. However, this is a bigger debate than I want to get into here today. Having got our food, we walked into the arena proper, probably the best moment of the day. In that one second, I felt like I had arrived at the Olympics. The lights, the colours, the fans and flags. The athletes warming up on the rubberized court. We had amazing seats, second row of the second level, right on centre court. We were right on top of the action. In truth, the Copper Box is such a small arena, I don’t think there were any bad seats, but ours were special. Our first match was Angola vs. Russia and it turned out to be a nail-bitter. If you’ve never seen a game of Team Handball, I suggest it. It’s a very fast, action-packed sport, with lots of scoring and athleticism, and a lot more contact than you might expect. The shooters throw their bodies around with an abandon rarely seen in other sports. It’s actually surprising that the game has not caught on more than it has. While the predominately British crowd got behind the Angolans, they just couldn’t quite pull it out against the Russians, losing 27-30. I don’t think either team is generally considered the best in the sport, but it was fun to watch. Our second game pitted Spain versus Korea. Although lower scoring, the game was still a hard-fought affair. However, Korea showed better teamwork, and had a really stand-out player, number 11, a solid rock of a woman who fired home at least 9 goals. Korea took the lead early and despite a few close moments, never really relinquished it. Riding high off the adrenaline of our first Olympic experience, we left the Copper Box with big smiles, and an hour-and-a-half to kill before our next event. This gave us a chance to wander around the Olympic park. Since most sports were still in session at this point, the park was full, but not what I would call crowded. Let me tell you, the designers of the park deserve special praise. How they managed to construct such a beautiful, well designed, and enchanting place right in the middle of London, I will never know. We walked down broad paths, through nice gardens, with loads of benches and grassy banks to sit upon. There was an outdoor amphitheatre with a huge screen showing action from the sports. There was a waterfall pouring down from one of the bridges over the Thames. There was a stage where bands played. And all around, were the amazing buildings built to house the events. The most intriguing of the buildings is definitely the Velodrome (although people are taking to call it ‘The Pringle’ because of its similarity in shape to the potato chip.) Considering that there were no events taking place in it on our day, it would have been nice if they would have let people inside to have a look, but I suppose they were still getting it ready for the competition. Wisely, the park designers had kept the food stands confined to a few areas, so that they didn’t mar the beauty of the rest. After the slight disappointment that was lunch, we arrived at the basketball arena. This building is the one architectural failure of the park. A huge box, covered in wavy white plastic, the whole thing appeared cheap and temporary. I’d be interested to know if it is going to stay beyond the end of the games. Our seats for this event were not the best. We were way, WAY, up. In fact, we were one row from the ceiling, off in one corner. This meant that we were behind one of the display boards, and blocked from seeing the other. Still, our view of the court was unimpeded. In an amusing coincidence, our first game once again featured Angola. This time, the poor Africans were totally destroyed by the Turks. The Angolans didn’t score for most of the first period, and the game would have become laughable, if the Turks didn’t also have some problems putting the ball through the hoop. More interesting than the game, was the slow realization that most of the crowd had little understanding of the game. The announcers did their best to explain the rules as the game went along. Growing up along Tobacco Road, I was born in a culture of basketball, so it never even occurred to me that people wouldn’t know the basic rules of the game, but there you are. On the downside, because basketball is such an American game, they tried to bring an element of Americanization to the presentation. I didn’t mind the loud music, but the silly man, who picked up the microphone during every time out to shout meaningless gibberish at the crowd grew tiresome very quickly. It also meant that every break between quarters and during halftime we were treated to performances of mixed level. Actually, the jump-rope team, whose name I missed, were incredible, a great testimony to kids who work hard. Still, I kind of wish they would just let the sport speak for itself, and not worry so much about having to ‘entertain’ the crowd. The second game was more special to me: USA vs. Croatia. While London 2012 is my second Olympics this is the first time I would see a US Team in action. Not only that, but this USA team is supposedly one of the best ever assembled. That said, Croatia is no slouch in basketball. Both teams started a bit tense, and the first quarter featured lots of missed shots. Midway through the second quarter, the game was tied at 21-21. When the half finally ended, the USA was up by 3. The crowd, again primarily British, loved the underdog. I usually like to support an underdog myself, but not today. I wanted my USA women to send me home with a victory. The third quarter was a tense, hard fought affair. It went back and forth, with the US unable to shake Croatia who hung around, always around 3 points down. Then, at the start of the fourth quarter, the US coach unleashed his secret weapon. He subbed out all five players, and put an entirely fresh team on the court. All the fresh legs proved too much for the Croats. In a matter of minutes, they were down a dozen. When the coach put the starters back in, now rested up, they continued the damage, increasing the lead to twenty and putting the game out of reach. I admit it, I loved it. The Croats played a brave game, they just didn’t have enough depth to keep up. Escaping the building just before the final buzzer, we got the jump on the 20,000 or more fans who would be leaving the building. Exhausted, but elated, we decided it was time to call it a day on our Olympic experience. Exiting the park, we encountered our first real crowd of the day, in a bottleneck created by one of the bridges and the channel through a shopping area, but even this we passed through quickly. Once it widened out again, the crowd dispersed to the numerous forms of transportation. At the nearby station, we hopped on a waiting and un-crowded train that whisked us back to central London, and from there, we had an easy trip back to Oxford. I know these Olympics aren’t perfect, and there have been complaints about this and that. But there are few events in the world (if any) that require organization on the scale of the Olympics and a few problems are inevitable. For my part, I think the organizers did an incredible job, and deserve huge praise. For my wife and I, it was a near-perfect Olympic day. 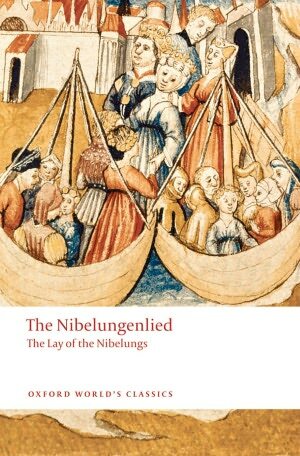 I am currently crawling my way through The Nibelungenlied (The Lay of the Nibelungs), the German Medieval romance that tells the story of the great hero Sivrit. These days, the story is probably best known for its connections to Wagner’s Ring Operas and the story of Siegfried. For the most part, it is really dull. There seems to be endless descriptions of clothing, the making of clothing, the acquisition of clothing, the giving of clothing, and, of course the comparisons of clothing. I take it that clothing was a big deal back in those days. Still, I persevere mainly because it is an important primary source for medieval myth and legend, and for the occasional mention of some strange, fantastical or otherworldly something. One of the little details that made me smile was the name of Sivrit’s sword. As mentioned before on this blog, I have an interested in named swords. So much so, that I really ought to write them down somewhere. That somewhere, I’ve decided is here. So I’ve created a new page on the blog for legendary swords, which can be accessed by the tab on the top. Sivrit’s sword is called ‘Bulmunc’ and it is described as follows. ‘an elegant broadsword, which was so sharp that it never missed its mark when it struck upon a helmet – its edges were of fine quality’.